We'll Fix Your Fleet Vehicles, We Guarantee It! At Coopers Auto Repair Specialists, our top priority is keeping your fleet vehicles running smoothly. You’ll find a unequalled combination of friendly, top-notched professionals who deliver convenient fleet repair and service at an affordable price. Pierce County and South King County business owners have been relying on us since we opened. We are trusted to service Central Pierce Fire and Rescue light/medium vehicles. So, you can be confident your vehicle fleet will be expertly serviced by seasoned professional whose integrity and expertise are unparalleled. When you choose Coopers Auto Repair Specialists, during each visit you’ll receive an accurate, unbiased assessment of the vehicles needs with our sound advice on how to save you money in the long run. When you want quality, convenience and the most value for your budget, you can count on Coopers Auto Repair Specialists for your auto repair needs. We make fleet repair quick, affordable and hassle-free! Too busy running your business when it is time for services? Ask us to pick up and deliver your fleet vehicles. Have a busy day schedule? Use our covenient courtesy shuttle service to and from your business. Need help tracking your fleet’s need? We can manage your fleet maintenance program for you. Must drop off early? Or need repairs on the weekend? We open at 7:30 AM Monday-Saturday. We’ll offer Net 20 to pay on invoices with approved credit, or financing 6 months same as cash. We Offer More Value For Every Dollar In Your Budget. Priority Service: Our fleet customers enjoy priority service and attention, ease of scheduling and service assistance. Fleet Pricing: Your business, employees and their families will enjoy the discounts we offer through our aggressive Fleet pricing. 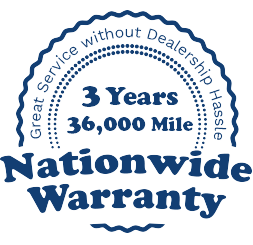 Hassle Free Warranty: Your repair is guaranteed locally in house for 3 years, 36,000 miles and nationwide for 2 years, 24,000 miles.